Experiment name: Study on Jacquard shedding mechanism. In weaving if we want to make any design in our fabric we have to separate the warp yarn according to our weave plan. In tappet or dobby shedding we have some limitations in shedding for a critical design. But in jacquard shedding it can be done easily. Jacquard is a shedding device placed on the top of the loom to produce large no of patterns by using a very large no of warp threads separately by means of harness cords, hooks and needles. The figuring capacity of a jacquard is 1800+. It means it can produce design with more than 1800 warp threads by controlling them individually, which is far beyond the capacity of a dobby or tappet loom. For shedding mechanism here punched card are used which is made according to design. One pattern card is used for one pick. With these pattern cards pattern chain is made which is placed on the pattern cylinder. On each pick pattern cylinder rotates 1/4th of the full rotation in clockwise direction. At the same time it oscillates to and fro forming an arc. 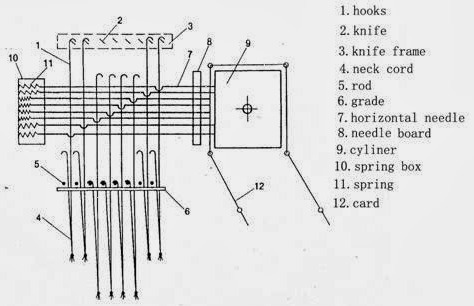 With every 1/4th rotation a new card comes front of the cylinder in the hook side and for the two and fro movement the needles enter inside the holes of the punch card. This selection of entrance inside the punches of the needles is actually done according to design. If a needle enters in the hole of the card the needle remains stationary in its position. So the needle crank also remains stationary in its position. So for the upward movement of the knife the hooks also goes upward along with the warp threads to form the top line. But if needle gets no perforation to enter, the hook is pushed to the right and as result the needle crank takes away the hook along with it. So when the corresponding knife goes upward it cannot lift the hook with it. Thus the warp ends of those hook remains fixed in its position and form the bottom line. After certain time the knife releases two hooks which is lifted to form the top line and due to wrap tension and dead weight the heald eye comes down. Its downward movement is controlled by grid bar. Each needle has a spring push at its right and that spring pushes back the needle when the next card comes. By this experiment we learned about the jacquard shedding and how it works. It is the finest of all machines for making the designed woven fabrics that have been invented and far superior in capacity to a dobby or tappet loom.